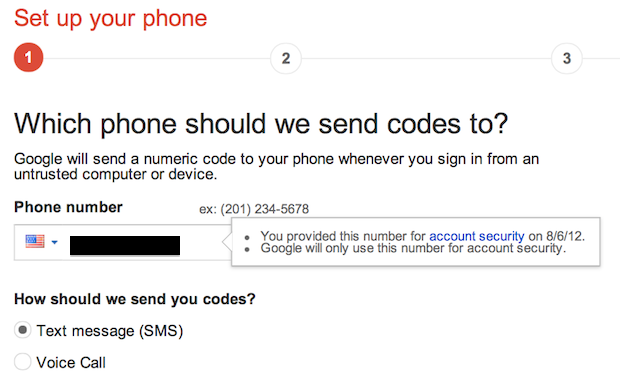 Google's two-step verification is an optional but important level of security that not only requires your password, but also a passcode that gets sent to your phone via text or voice. Any computers you mark as "secure" will only require you to enter the code once every 30 days, but all other computers will require you to enter it every time. 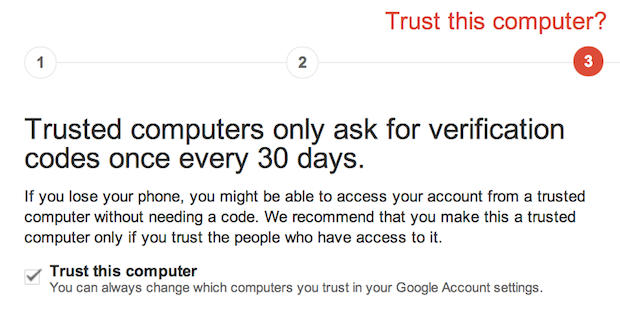 Some apps and services do not yet support Gmail's two-step verification. Three of those apps includes Apple's built-in Mail for iPhone, iPad, and Mac. The good news is that Gmail has provided an alternate method to increase your security -- requiring a separate, auto-generated password for each of those apps. Like I said, initially setting up 2-step verification is a bit of a hassle, but the extra security it provides is priceless. Enter in the phone number you wish to receive the verification code at and choose whether to receive it by text or voice call. Receive code and enter it. Decide whether to trust the computer you're using or not. Click Next. 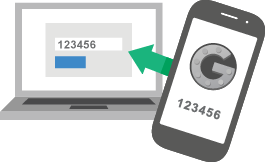 Read info about 2-step verification. Click Confirm. Two-step verification activation is completed. Gmail will log you out and return you to the login screen. 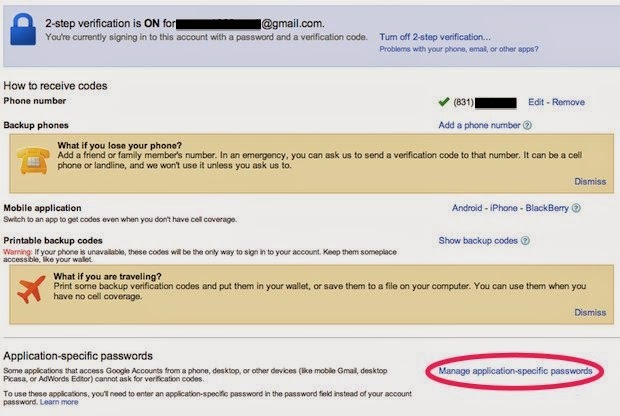 Since you have enabled Gmail two-step authentication, you will probably notice that all of your Mail clients, including your iPhone, iPad, and Mac, start giving you incorrect password errors. This is a good sign because it means your activation was a success. To access your Gmail from your iOS and Mac Mail clients, you must create separate passwords for each one. You will immediately be taken to screen informing you that two-step verification has been activated and provide you with further options. The first one is to enter a backup phone number (very good idea) and the second to is get list of printable codes (never store these codes on the internet such as in Dropbox, MyDrive etc). 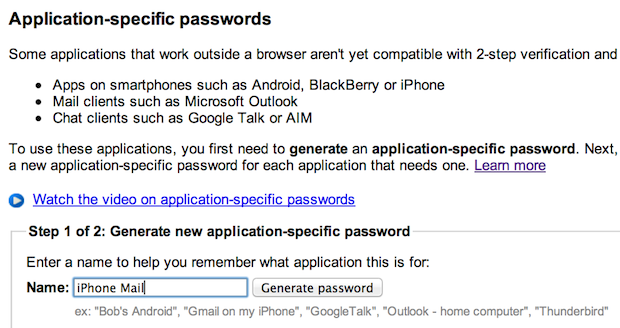 The third one is the one we're most interested in right now; it's called "Application specific passwords". Click the Manage application specific passwords link in the lower right-hand corner. At the bottom of the screen you should see a password generator. Give a name to the password you're generating. Be as specific as necessary. For example, if both you and your wife use iPhones, share a Gmail account, and will access the account from both iPhones, make sure you give each device a separate name like "Jenifer's iPhone" and "Larry's iPhone. Immediately enter this passcode into your iPhone's Mail Settings via Settings > Mail, Contacts, Calendars > Accounts. Do not enter spaces. Repeat steps 4-5 for iPad, Mac, and any other devices you may want to access your Gmail account from. There you have it. Now you're all set to use Gmail's two-step verification security feature and still have access to your email from the Mail clients on your favorite devices.